‘Last year a public toilet was set up. It did not have any water connection. The tanker was supplying water. Now they have created a park around the toilet. The toilet lacks water connection and because of that they shut it down. When it was open, it was never clean,’ said Ramaaji*, a waste-picker who lives in a basti (informal settlement) near Bairagarh Railway Station. She along with other waste-pickers in the given neighborhood belong to Bhil (Adivasi- indigenous) community. They have their roots in Dahod district of Gujarat. 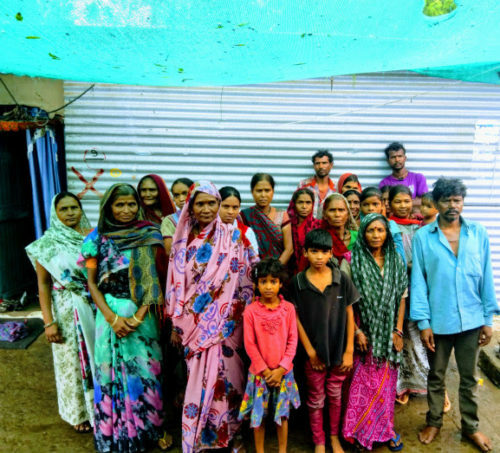 In their home village, there was no work. It rains very little and only one crop is grown. ‘I came here around 50 years ago. I spent all my life in this area. I had my daughters and grand-daughters here. We had no work there. My parents left that place and came here in search of work. At that time, the trains used to run on coal. A lot of times, the trains spilled coal. We used to pick it and sell it and earn money to live by’, said Sunita, who is a long-time resident of the basti. Once the coal-based trains stopped operating, the people in the basti went looking for work. They got as casual labor and later some scraps shops opened in the vicinity. The basti dwellers moved from coal picking to casual work to waste-picking. In the group of 3-4, at around 3 in the morning, they leave for waste-picking. They come back by 10 or 11 in the day and then rest. Once a week, they sort the material to sell it to the neighborhood scrap shop run by a Sindhi. The scrap shop owner buys all the sorted material. Sometimes he gives a credit. The credit may amount to INR 10,000. They are told that they pay 6 percent rate of interest. But their installment is around INR 600 per month and lasts for almost 2 years and amounting to INR 14,400. INR 4,400 is paid as an interest rate. There are around 100 families in the basti. Most of them are from Dahod. There are around 70 children. Some of them go to government schools, some to the private and some have dropped out and gone for waste-picking. Those who go to school, few of them end up in going for waste-picking after they are done with school. The basti dwellers agree that the children should not be engaged in work, yet children provide supplementary income to the family. There is a dumping ground near the neighborhood. A lot of children were seen picking up valuable recyclables from the waste. From past few years, Samman, a Bhopal based organization is making efforts to organize waste-pickers and support children in their education. They have set up a tuition center within the tin sheds of the basti, where children come to learn, even those who have dropped out. There are around 30-35 children who come to the tuition center. They have started a ‘savings group’ (self-help group) to save money, which they can use whenever they need to. Ramaaji and few other women have been hired by a contractor to do door to door collection of waste from houses in Military Station nearby. They get INR 3000 as cash per month. It takes the whole day to do the collection. They put organic (wet) waste in a small truck, which is taken far away for processing or dumping (no one knows). The women workers retain the dry waste and bring it home. They get an entry pass to enter the military area. The pass is renewed every month. A lot of men and women (as mentioned earlier) go out for waste-picking in different neighborhoods. They sort the material in open space and aggregate it in their dwelling. Some of the residents complained that the city authorities trouble them a lot. They confiscate the material. In another neighborhood, Jawahar Chowk waste-pickers complained of arbitrary arrests by police. ‘Police officer asked me to bring everything out of my bag. I showed him everything. Then he let me pack it and said you can do waste-picking, but you should never steal, and he let me go’ said Sumitra*, who is a resident of Jawahar Chowk basti. Sumitra was lucky, not all of them are lucky. ‘They pick us up as if we are thieves. Someone must have stolen valuables. The police could not find the culprit. They put us behind the bars to hide their failure’, said Ramnath*. Ramnath and Sumitra like Ramaaji live in a tin shed basti. Their Jawahar Chowk basti is a temporary colony. 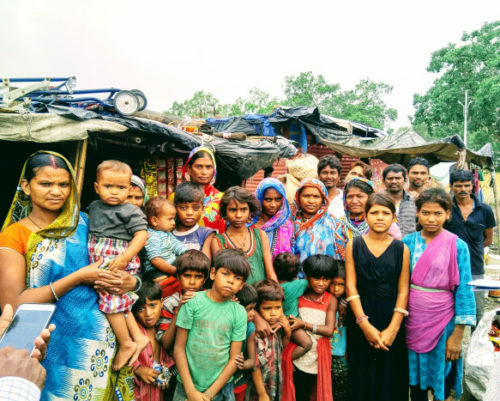 Some of the basti dwellers came from Maharashtra, others from within Madhya Pradesh. There are few Gond Adivasis (indigenous community), some are from the weaver caste. They did not get any work in their place of origin and chose to move to Bhopal. When they came to Bhopal, they engaged in stone crushing. When the mines shut down, they moved to waste-picking. The residents of the temporary colony were brought there from another neighborhood, Meera Nagar, where they were living for more than 30 years. ‘Indira Gandhi allotted us that land to live’ said Tulsibai. Now they have built a multiple apartment complex in the original site, basti dwellers call it ‘multi’ in their lingo. The waste-pickers/residents were asked to give 15000-18000 as down payment and a monthly installment ranging from 1500-1700. Many families could not afford the amount. Once their homes were demolished for construction of ‘multi’ they chose to stay on the road nearby. Then they were moved to the temporary settlement in Jawahar Chowk. The temporary settlement is on a slope. The homes which are at lower gradient get flooded. The corporation has provided toilets but there is no water connection inside the toilet. A tank has been put up in the basti and few taps for water supply. The water is yellowish in color and is undrinkable. Bhopal ranked as the 2nd cleanest city in Swachh Bharat Surveykshan (Clean India Survey) 2018. 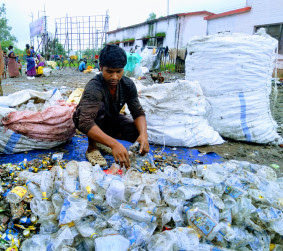 It has not made sincere efforts of integration of waste-pickers in solid waste management. The waste-pickers are the backbone of solid waste management as acknowledged in both Solid Waste Management Rules 2016 and Swachh Bharat Survey guidelines. They have not received their due whether in the form of quality housing, clean water or access to sanitation facilities.